Beautiful property created from the restoration of an ancient farm, situated in panoramic and dominating location in the Umbrian countryside, approx. 25 km away from the town of Orvieto. Casa Fabro comprises 2 units (rentable together) situated approx. 10 m from another and offers a wide and well-stocked garden with terraces and pergolas, 5 barbecues and a children playground. A nice fenced swimming pool is available (to be shared with the owners when present in the property) and provides an area suitable for children (maximum depth 30 cm). This property also comprises the owners house where they live occasionally. 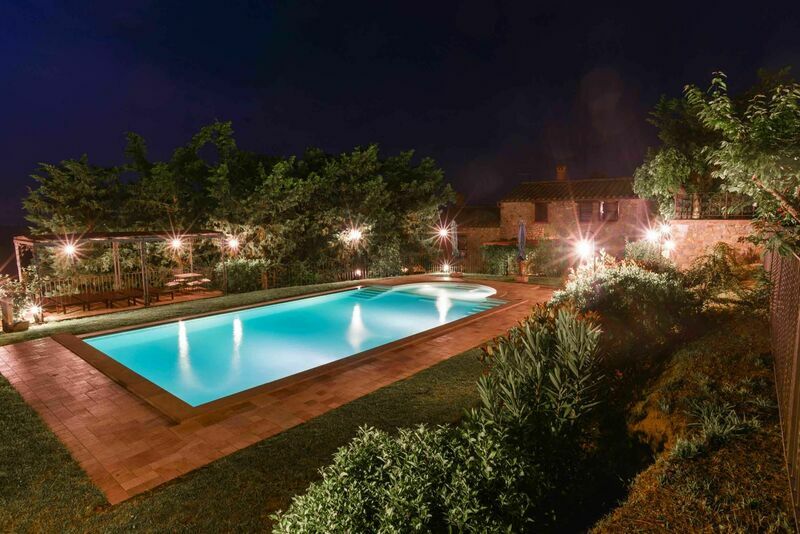 The outside areas guarantee privacy and allow to enjoy the tranquility of the Umbrian landscape. Distances: Fabro Scalo with all kinds of shops and railway station 3 km away, the beautiful town of Orvieto 25 km, Città della Pieve 15 km away, Perugia 60 km. Rome is approx.115 km away. At guests’ disposal: wide outdoor area equipped with tables, chairs and pergolas for outdoor dining, fenced swimming-pool (10 x 6 m - maximum depth 1,5 m - open from 01/05 to 30/09) with a children swimming area (maximum depth. 30 cm), 5 barbecues. The villa is provided with mosquito nets, washing-machine and ironing facilities. Mobile telephone available. Parking within the property. Extra services to be paid on the spot: Baby bed available on request (€ 30,- / per week). Extra bed available at € 70,- / per week. Maid service available by arrangement at € 12,- / per hour. On request it is also possible to organize dinner service in the property (prices available upon request). The olive oil produced on the estate is available for clients to be purchased. Ground floor: large living-room with 2 fireplaces, TV area (satellite TV flat screen, DVD, stereo), dining area and kitchen corner (oven, freezer, dishwasher, toaster, microwaves, American coffee maker, espresso coffee machine), double bedroom, bathroom with shower and bathtub, bedroom with a single bed, bathroom with shower. Access from the ground floor to an outdoor area with gazebo, table, chairs and barbecue. 1st floor: the first floor is made of 2 connected apartments (connected by a door) comprising: a living-room with fireplace, dining area and kitchen corner (oven), access to a covered terrace looking over the garden, a double bedroom with ensuite bathroom with bathtub, a passage-way bedroom with a single bed, a second living-room , fireplace, dining area and kitchen corner (oven), a double bedroom and a bathroom with shower. Independent outbuilding situated 10 m away from the above house. Ground floor: small living-room and wood burning stove, kitchen (oven, freezer) with access to a covered terrace equipped with barbecue. 1st floor: double bedroom with bathroom with bathtub.